This kind of Lizard somewhat resembles the Crocodile or Alligator in shape, but has a shorter Head, and a serrated Crest on the Ridge of the Back, extending from behind its Head to the middle of the Tail. They are of various Sizes, from two to five Feet in Length, their Mouths are furnished with exceeding small Teeth, but their jaws are armed with a bony Beak, with which they bite with great Strength: They inhabit warm Countries only, and are rarely to be met with any where North, or South, of the Tropicks. Many of the Bahama Islands abound with them, they nestle in hollow Rocks and Trees; their Eggs have not an hard Shell, like the Eggs of Alligators, but a Skin only, like those of Turtle, and are estem'd good Food; they lay a great Number of them at a Time in the Earth, which are there hatched by the Sun's Heat. These Guana's are a great Part of the Subsistance of the Inhabitants of the Bahama Islands, for which Purpose they visit many of the remote Kays and Islands in their Sloops to catch them, which they do by Dogs trained up for that Purpose, which are so dexterous as not often to kill them, which if they do, they serve only for present spending; if otherwise they sew up their Mouths to prevent their biting, and put them into the Hold of their Sloop till they have catched a sufficient Number, which they either carry alive for Sale to Carolina, or salt and barrel up for the Use of their Families at Home. 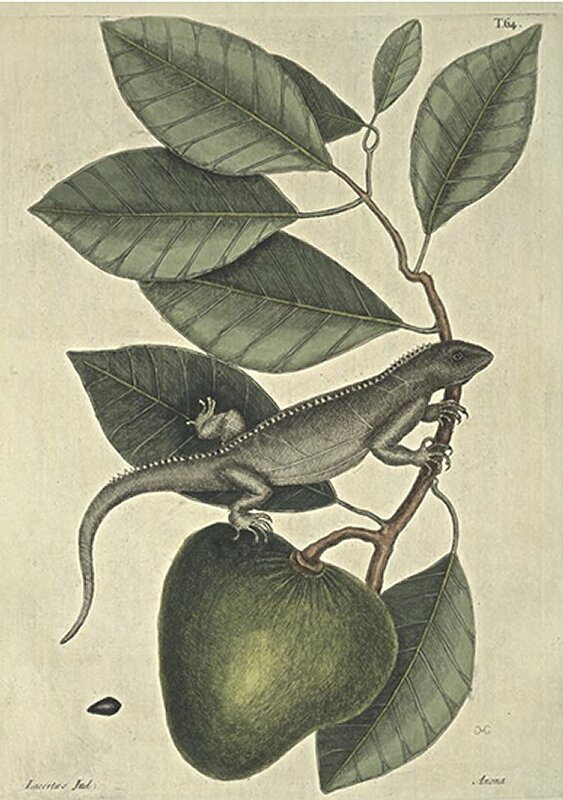 These Guana's feed wholly on Vegetables and Fruit, particularly on a Kind of Fungus, growing at the Roots of Trees, and of this and others of the Anana Kind. Their Flesh is easy of Digestion, delicate, and well tasted; they are sometimes roasted, but the more common Way is to boil them, taking out the Leaves of Fat, which they melt and clarify; this they put into a Calabash or Dish, into which they dip the Flesh of the Guano as they eat it: It is remarkable that this Fat which adheres to the Inside of the Abdomen, imbibes the Colour of the Fruit they last eat, which I have frequently seen tinged with pale red, yellow, and sometimes of a purple Colour, which last was from eating the Prunus Maritima, which Fruit at the same Time I took out of them. Tho' they are not amphibious, they are said to keep under Water above an Hour: When they swim they use not their Feet, but clap them close to their Body, and guide themselves with their Tails: They swallow all they eat whole. They cannot run fast, their Holes being a greater Security to them than their Heels. They are so impatient of Cold, that they rarely appear out of their Holes, but when the Sun shines. This Shrub or small Tree grows to the Height of about sixteen Feet, with a small Trunc, and smooth greenish Bark, the Leaves thick, stiff, and shaped like those of a Limon, the Flowers I did not see. The Fruit is in Size and Form of the Figure, covered with a smooth yellowish green Skin. The Pulp or Flesh of the Fruit of the Consistence of a ripe Pear, containing many conic brown Seeds: This is an eatable Fruit, very sweet, but somewhat insipid, yet it is the Food of Guana's and many other wild Creatures.